Emotion regulation is an integral part of human daily activities. Despite the widespread interest in emotions evident in such fields as psychology, education, engineering and business management, very few testable statistical models exist for explaining how emotion regulation unfolds over time and how this process differs in laboratory vs. naturalistic settings. Testing such models provides valuable insights to scientists, practitioners and the general public on effective mood regulatory strategies. Recent developments in dynamic systems modeling have led to renewed conceptualizations of emotions as dynamic processes. Emotion provides a natural topic for eliciting interdisciplinary collaborations because the topic itself has wide appeal to different audiences and yet, emotion data present complex challenges for methodologists: they are often non-normal, of high dimension and do not show time-invariant change and distributional characteristics (i.e., are non-stationary). This project brings together researchers in the fields of psychometrics, emotion/psychophysiology, statistics, bioinformatics/biostatistics and financial econometrics to develop dynamic modeling techniques suited for studying emotion and other complex processes. 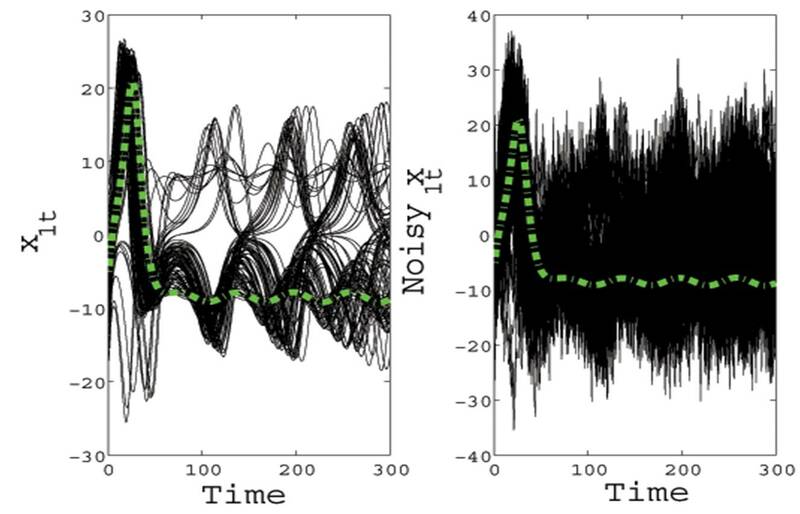 We are collecting multiple measures of emotions over different time scales, with specific aims of using these data to (1) develop methods for estimating and diagnosing differential equation models with time-varying parameters and random effects, (2) develop methods for analyzing the dynamics of electromyography (EMG) data, (3) use network-based methods to represent within-individual transitions among discrete affective states and (4) develop, organize and disseminate tools for studying complex, non-stationary processes to audiences across a variety of disciplines.